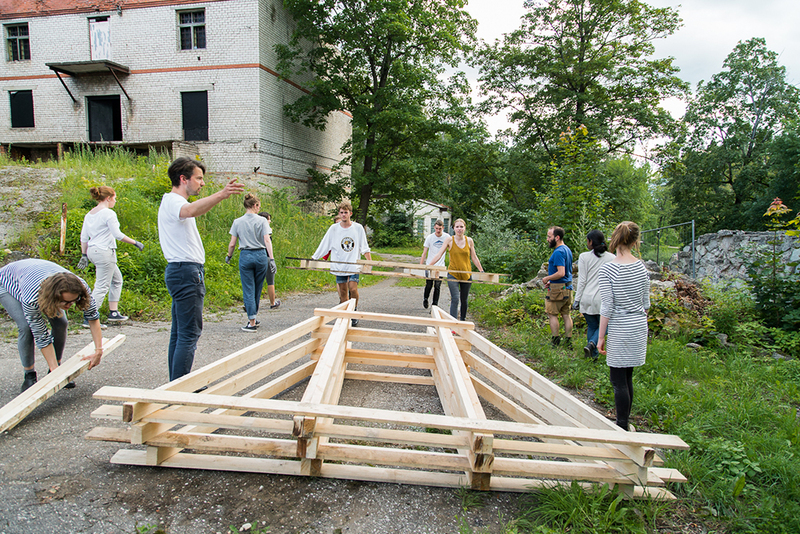 Night Train is a piece of kinetic event infrastructure built to host events and act as a beacon of change for a derelict brewery in the centre of the small town of Cēsis, Latvia. Plans are underway to transform the brewery into a centre of science and art through a process of slow and incremental improvements. Night train is a prototypical first step in this transformation performing a number of functions and mediating between the site and the town. 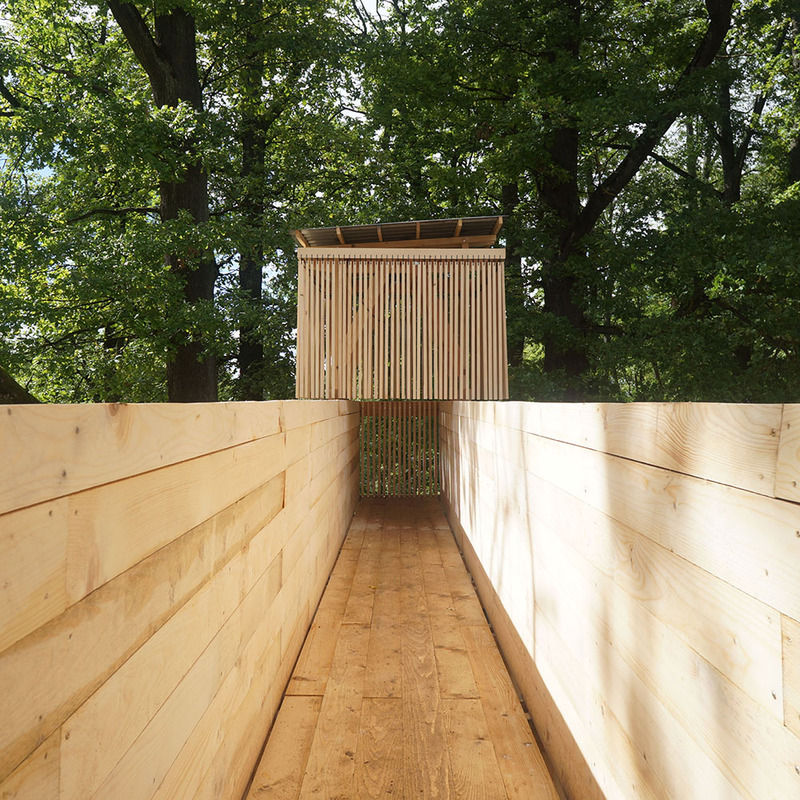 It is intended as a catalyst structure designed to host events, act as a site office for ongoing works and signal change to passers by throughout the year. The bridge-like structure spans the border of the derelict 19th century brewery site and the medieval castle park in the centre of the Town. 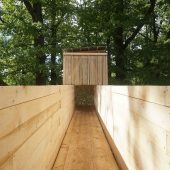 The structure is made entirely of locally sourced Latvian pine and comprises two main elements. A 13 meter long raised track, which is a table at the lower end and a viewing platform at the other. And a mobile timber framed ‘carriage’ containing a lamp shrouded in a fine light-defusing timber fringe. 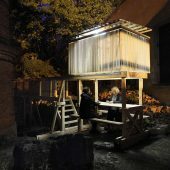 The structure was designed and built in two weeks by an international group of 13 students. The whole project was prefabricated adjacent to the site in 2 days and assembled in 2 more. 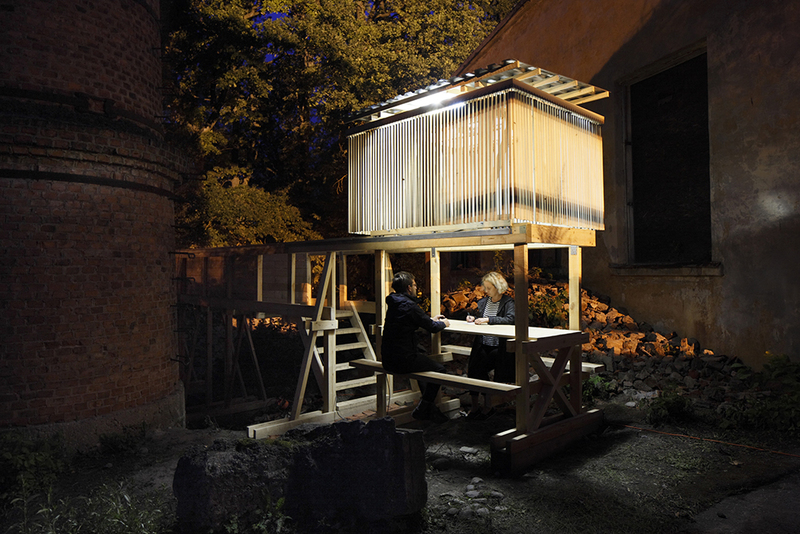 Research Question: We were interested in how a relatively small structure can signify and be part of larger processes of change in the built environment. The project continues our line of enquiry from previous building workshops of looking at how a structure can be embedded in the social context of a place using the catalytic power of events and social interaction to amplify the impact of a project. The structure aims to draw together a number of needs on the site into a single piece of event infrastructure to be used throughout the year. The project also aims to provide a link between the activity of the brewery and the people of the town by spanning dramatic level changes and industrial ruins across the boundary wall of the brewery itself to a public park on the other side. 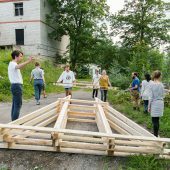 Architecture, Days, Initiated by institution, Undergraduate, Semi-permanent, 11-50, Sponsorship, Extra-curricular, Students with tutor, Cesis, Riga Technical Univ.